The Jose L. Piedra Conservas is a rich and powerful medium Long Corona, 5.5”(140mm) long, of 44 ring gauge, and comes in a 25 cigars box. The Jose L. Piedra Conservas is a very good option for a daily smoke: it is affordable and of great construction. • Hand-rolled cigar using short filler tobacco from the renowned Vuelta Abajo region. • Smooth medium bodied cigar with delicious flavors of wood, earth and nuts among others. A great pick for those who want to try a Cuban smoke without spending too much. Despite being a cheap cigar, its solid appearance really tells it apart from its competitors, the cheaper Habanos. The wrapper looks nice with a uniform Colorado Claro tone, the seams are tight and at the head the double cap is beautifully applied. The wrapper is also pretty oily, with few veins running at the surface of the wrapper. It feels solid in hands, with just the right amount of give when squeezed. It looks evenly packed from head to toe. The aroma coming from the cigar at cold is amazing. There are aromas of moist earth and tobacco. Once cut, the draw is perfect, perhaps just a tad too open. When put to the lips, the pre-light draw also gives some flavors of earth and of salty tobacco. Lighting up the cigar is easy, and the cigar burns nice and evenly. It doesn’t require attention and produces a nice dark grey ash. The first third of the cigar starts off with powerful and salty flavors of earth; there are also some woody and leathery flavors in the mix. Despite the intense flavors from the first puffs upon lighting up the cigar, the smoke is very smooth throughout. After few draws, there are also notes of nuttiness arising, along with notes of leather. The aftertaste is short, with some notes of moist earth and some sweeter hints. The body of the cigar is pretty light, in the mild to medium range for the first third. Overall, a very pleasant start of cigar, flavorful and of beautiful construction. In the middle third, the cigar offers steady and consistent flavors. The beautiful earth is still very dominant, even becoming tastier because the woody aromas slowly recede. The nutty flavors are getting more noticeable, as well as some light spiciness that is also coming to the foreground. 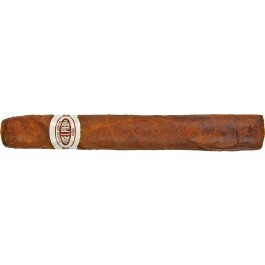 But the cigar never gets too spicy nor too harsh, the aroma remains spot-on, rich and smooth. The body of the cigar is still right under the medium range. In the final third, flavor profile doesn’t evolve too much, the spices increase once again. The wood, earthiness and nuts are still around, with some sweet notes joining the mix. Finally, some acidity from citrus is also appearing around the finish, without impairing the quality of the smoke. The body remains in the light-medium for the final part of the smoke. In summary, this is a beautiful cheapie. A great smoke to enjoy daily while going on your daily routine.